It’s an average evening. My partner and I have finished our dinner. He washes the dishes while I clean the table and eventually make my way down the three flights of stairs from my apartment to empty our trash cans. There are four cans and it takes me two trips to complete the task. First, I take the compostable bio-trash in its paper bag, and the “yellow-sack” recycling which consists of plastic and aluminum foil packaging. As I dump out the bio-trash I spot a stray piece of plastic and move it to the yellow bin. Next, I retrieve the paper recycling and the “residual trash” which contains everything that isn’t sorted into another container. Across the street are four large metal half-domes that are emptied weekly. They each have round openings with different colored lids, representing what color of glass should be placed in to them: white, brown, or green. I would empty my house’s glass waste into those containers the next morning, while hoping none of my housemates needed to get rid of blue glass (which I still haven’t figured out where to put). This was the first evening back from a week long volunteer trip. It had taken my mind off trash for a while, confronting me with other issues of sustainability (namely forest health and biodiversity; if you want to hear about my experience with Bergwald Projekt there will soon be a video on the topic on my personal YouTube channel). Now though, in these basic day to day actions I was once again face to face with my research topic. I’ve been in Germany about half a year now. Sorting out my trash is almost second nature to me at this point. I don’t have to think about where my plastic ice cream wrapper or my cardboard egg cartons go, I just plop them into their container. Still, mistakes and hangups happen. Plastic ends up in the bio-trash, or a slightly different set-up of trash containers throws me off for a second (some public areas, for example, do not have a bio-waste container, a fact which always makes me hesitate before figuring out what to do with my apple cores or banana peels). It took time to get to this point, certainly. The first several times I encountered trash cans, I had to stand in front of them reading the lists of things that went inside of them (helpfully labeled on the front of many cans, complete with pictures). Ultimately, I got most comfortable with the system by simply watching other people use it. I know though that different people pick up patterns and expectations in different ways or at different rates. For the first step of my research (beyond simply recounting my own experiences), I asked my housemates for help. I live in a house with four other exchange students. Two have been here as long as I have – about six months. Two are newer, having arrived within the last few weeks. I know that mistakes in our trash separation are common, but generally minor – lining the bio-trash with a plastic bag or placing glass bottles in the residual waste. I asked my housemates over our group chat what their experiences with the trash separation were. My first participant was one of our newest arrivals in the house. She has only been in Germany about two weeks as of the time of writing this. Despite that, she reported that the system was very easy to figure out, mainly because each box is labeled with what trash goes in it. Still, she says it would be easier if the product itself was labeled with which container it should go in. I found this to be a very interesting idea, as I have noticed that some products are in fact labeled this way, such as Nutella containers which tell you how to separate the packaging and dispose of each part properly. While the idea of doing this for all packaging is exciting, it isn’t ultimately helpful for my goal of figuring out how to improve Amherst’s waste disposal system. My second participant has spent far more time in Germany. She has lived in my house as long as I have, six months, but even before that she was often in the country to visit family who lived here. She also dates a native German who may have exposed her to proper waste disposal techniques as well. Not surprisingly, she reports that she has no problem separating her trash. Even the labeling on the cans is helpful but unnecessary. At this point she just knows what goes in what color bin. In order to have something to compare these responses to, I then turned to native Germans, who, unfortunately, were not particularly helpful. My partner, for example, was unable to give me any information beyond “you just know where stuff goes because that’s where it goes.” Other friends and classmates have given similar responses. Surely, being raised with the system must make it easier, but that can’t possibly tell the whole story. 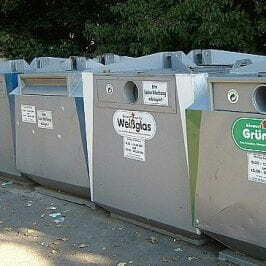 The Goettingen sanitation website gives some insight into the official work being done on this topic. The site covers many topics, from the concept behind Goettingen’s methods of waste management to maps of where to dispose of highly specialized waste such as electronic or particularly bulky items. Most interesting for my research though was their page on “waste management consulting”. The summary of the page (as automatically translated by Google) reads “The diversity of waste and its proper disposal, as well as new legal and technical requirements increasingly place higher demands on private and commercial waste producers […]we want to influence the actions of the individual waste producer so that unnecessary waste is largely avoided.” This consulting program targets a few specific groups: schools, the housing industry, companies, and construction sites. The programs targeting schools are particularly varied with multiple field trips offered, as well as materials and information geared towards various age groups. It is not stated how long these programs have been around. However, if such education has been widespread for a decent length of time, that could explain the insistence by native Germans that they have simply always known what to do with their trash. If children are taught how to do something, it would remove the need for later education. It is also possible that they would not even remember the lessons, leading to the illusion that they had never needed to be taught. 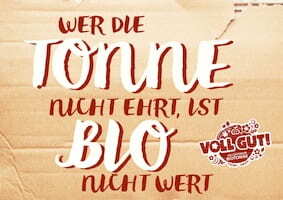 There is fortunately one publicly available educational campaign on the website: a campaign encouraging people to correctly and carefully sort their bio-trash as it is frequently contaminated. This fits with my own observation of my house’s trash. The campaign’s page states that, “The starting point for the initiative is the knowledge that bio-waste is not waste, but an excellent source of energy for people and the environment.” I feel that this is a very important step. If people recognize what bio-trash really is and how important it is, they are more likely to put in the effort necessary to sort their items correctly. Additionally, it is possible that many of the contaminants come from people who simply do not know what is truly compostable. Much of the campaign appears to utilize aesthetically pleasing graphics, posters, and (when possible) an in-person presence to answer questions. The idea seems to be that if you get people’s attention, they will generally listen and absorb what you are telling them. It’s not that people don’t want to correctly sort their trash. They simply haven’t had their attention drawn to what is going wrong. My research so far has been very local and anecdotal in nature, in an attempt to shed light on the current situation and how it broadly functions. For the next portion of my research, I hope to look more into the history of this system: how it was put into place and earlier public education campaigns. Seeing how it started can show us how it got to where it is now and give us ideas on how to start new initiatives at Amherst.